Split/Second is a new racing game from Black Rock Studios, the makers of Pure. In Split/Second you play the part of a driver in a reality TV show based around street racing. Black Rock was showing off the game at PAX East, and I got to give it a try. One thing is immediately clear when you start playing, Gran Turismo this ain't. Split/Second is firmly in the arcade racer camp, not really surprising given its 'reality show' premise, so if you demand realism from your racers, then you should avoid the game. On the other hand, if you like a lot of explosions, then Split/Second might be just your thing. The level I played, a two lap street race in Downtown Central, had a lot going on, and the city felt like it was an active and busy place, but even with that very rich environment, the game ran at a breakneck speed and the backdrop never distracted me from the actual racing. The course is designed with obstacles for you to try and drive other racers into, but crashing in Split/Second is am inconvenience, rather than the end of your race. The mechanics of Split/Second are pretty simple; dangerous and entertaining driving like jumping and drifting will fill up your 'Power Play' bar, which you can spend to make things blow up and hinder other drivers, or open up secret paths. You're not the only one with a 'Power Play' bar however, and your opponents can add hazards to try and hinder you as well. 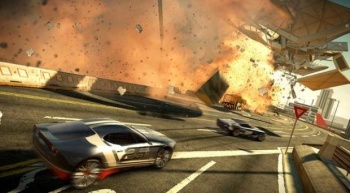 One particularly intense moment comes on the second lap of the demo, when one of the AI drivers triggers its 'Power Play' bar and a backhoe drags its bucket across the track, throwing a shower of sparks into the air, accompanied, or course, by an explosion. I found that the actual driving in Split/Second was very forgiving; the controls were simple, and the car handled pretty well. I started off the game by braking into turns, but after a lap and a half realized that I didn't actually need to for most of them, and could just ease off the accelerator. Again, if you demand realistic handling in your racing games, then you're not going to enjoy Split/Second very much, but if Mario Kart or Burnout Paradise is more your speed, then you're likely to have a lot of fun. Split/Second is released on May 18th.